For your noise exceeds the thunder in the falling of the pine. And the wolves and bears we’ll shock at the falling of the pine. And like brothers we commence for to fall the stately pine. And we’ll make the valleys ring at the falling of the pine. It can never keep us in from the falling of the pine. Until the booms are gathered into handsome rafts of pine. And, my boys, we’ll ne’er refuse to go back and fall the pine. The melody above comes not from Rickaby’s 1923 transcription but from my own 2012 transcription based on the recently discovered 1924 recording of Dean’s singing made by Robert Winslow Gordon. Dean’s melody on the Gordon recording is considerably different from Rickaby’s transcription taken down just 14 months previous! Part of the reason is likely some bias in Rickaby’s assumptions about what the “right” notes were. Dean’s singing on the Gordon recording also shows him using a lot of melodic variation between different performances of the same song (two songs were recorded twice on the Gordon cylinders) in addition to quite a bit of melodic variation between verses within songs—a hallmark of a great traditional singer. 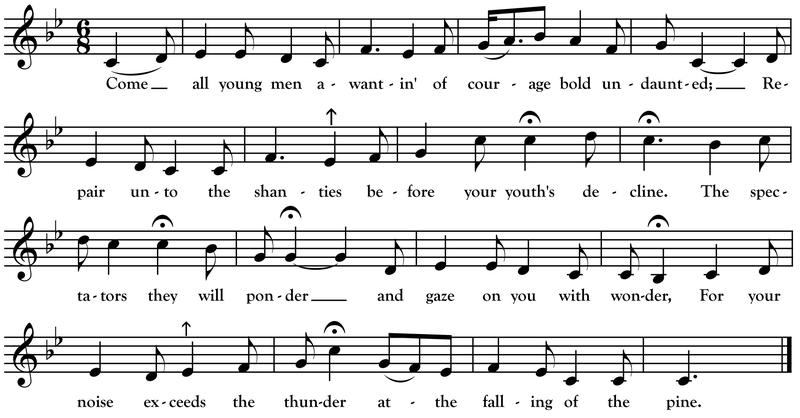 Transcription note: Dean, like many traditional singers, makes occasional use of “in between” notes and I mark two of his slightly raised pitches with arrows in the above transcription. *“Scoring” and “lining” were part of the squaring process.